Time to reflect and to look back as well as ahead! 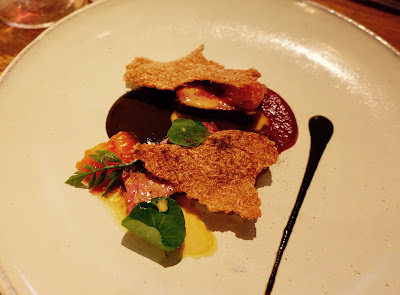 After having done my first steps towards a more serious blogging activity about luxury travel and fine dining it is time to think about my work as well as to look back to 2016 and to look ahead to 2017. When I started blogging in 2009 my blog consisted mainly of hotel reviews posted previously on TripAdvisor. Due to a professional reorientation I was forced to stop my blogging activity for three years. At the beginning of 2016 I decided to resume it, but this time I wanted to do it properly. 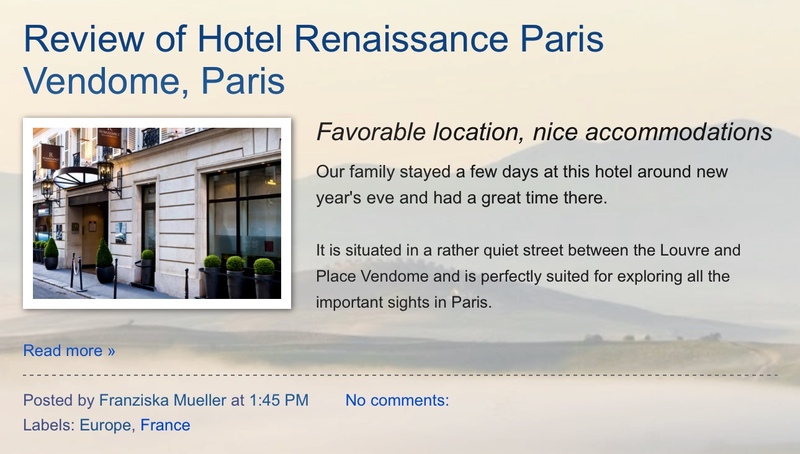 Not only should the hotel reviews be continued, but also restaurant reviews and travel reports should be added. I soon realized that blogging is much more demanding than I had thought. I will not go into details, but writing posts is only one part of the work. There is so much more such as the technical aspects of blogging, the promoting of your blog, browsing through established blogs, trying to get in touch with other bloggers and struggling to improve with each new post. It is a never-ending journey – and much underestimated by others who are not in the business! But I do not want to complain, I absolutely love blogging. I am still in my early stages and many things need to be improved. In case you have tips for me, do not hesitate to share them. When reviewing my posts, the goal to make reports of all my trips was reached. I also succeeded in reviewing most restaurants visited in the region of my home town. However when it comes to detailed hotels reviews of the past years, there is still a long way to go. I worked off two years of hotel stays, but two other years are still waiting to be dealt with. In the light of this situation I had to drop my plan to make reviews in details of all the restaurants visited during my trips in 2016, it simply would have been to much work. But I have the firm intention of making it true in 2017! As far as my blog as a whole is concerned, there is still a lot to be done, be it on the technical side, but also content-wise. I cannot change the fact that it is a blogspot blog, with all its limitations, but I try to make the best out of it. What can be changed is everything in the context of writing. I must make sure that I produce quality content which appeals to the audience. Other important tasks involve enhancements regarding promoting my blog on social media and networking with other bloggers. Here again I would be more than happy about tips from more experienced bloggers! Following travel destinations were on my agenda in 2016: ski vacations in Zuers in the Austrian Alps, a short trip to Lisbon in South Europe, ten days in eastern USA (NYC, NOLA and Florida), a week on the Costa Brava in Northern Spain including Barcelona, two other short trips in the German-speaking part of Europe (Davos and Vienna), a little bit more than fourteen days in South Asia (Singapore, Bali & Lombok), almost one week in the Middle East in Muscat/Oman and finally some days in Davos for skiing. NYC, always a fave of mine (here Meatpacking District)! One of the highlights of my travels in 2016 was the trip to the Costa Brava in Spain in South Europe. I was prejudiced because of its reputation as a destination for mass tourism, but I was proved wrong. It is an absolutely wonderful area with probably the most stunning scenery of cliffs and sea views I have ever seen! Not all my travels for 2017 are already fixed of course, but three of them are booked: the tenth stay (A record for me!) in Zuers/Austria for skiing vacations at the gorgeous Zuerserhof, a second visit (after 2015) to the superb city of Hong Kong, this time with my husband and our adult son and my first trip to South America, and this a round trip in Ecuador followed by a Galapagos expedition cruise (My first cruise!) aboard Silver Galapagos. There is even a travel plan for 2018: a four weeks trip to Australia, New Zealand and maybe to the South Sea. Recommendations for these destinations are very welcome! Now I wish everyone a happy travel year with lots of satisfying experiences! Do you have blogging and travel experiences for 2016 and/or travel plans for 2017 to share? This post has been added to the January #travellinkup hosted by Angie, Emma & Polly (many thanks to the three of them). All I can say is write what you feel passionate about - that'll help ease the hassle! Thank you very much for your kind words, it helps! I like your blog and the one of Angie who seems to visit all the places I do.